(həd), (həd) Planet Earth, (həd) Planetary Evolution, (həd) p.e. 1 2 3 Rivadavia, Eduardo. "Biography of Hed PE". Allmusic. Retrieved 2008-08-23. ↑ Udo, Tommy (2002). Brave Nu World. Sanctuary Publishing. pp. 174–175, 243. ISBN 1-86074-415-X. ↑ "28 Nu-Metal Era Bands You Probably Forgot All About". NME. Retrieved 11 December 2015. 1 2 3 Scire, Dawn (2003-03-14). "(hed) p.e. 's frontman touches down.". Sarasota, Florida: Sarasota Herald-Tribune. Retrieved 2008-08-23. 1 2 3 4 5 McIver, Joel (2002). Nu-metal: The Next Generation of Rock & Punk. Omnibus Press. p. 61. ISBN 0-7119-9209-6. 1 2 3 4 5 Echeverria Jr., Steve (March 4, 2005). "Check your HED; HED p.e. declares independence.". Sarasota, Florida: Sarasota Herald-Tribune. Retrieved 2008-08-23. ↑ Huey, Steve. "Review of (hed) pe". Allmusic. Retrieved 2008-08-23. 1 2 Owen, Arrissia (November 25, 1999). "Not So Hed, Not so (pe)". OC Weekly. Retrieved 2008-08-23. ↑ "Charts and awards for Broke". Allmusic. Retrieved 2008-08-23. ↑ Taylor, Jason D. "Review of Broke". Allmusic. Retrieved 2008-08-23. ↑ Tussing, Lauren Consuelo (April 14, 2003). "Misogyny doesn't end in the studio". Boise, Idaho: The Arbiter. Archived from the original on 2008-12-11. Retrieved 2008-08-23. ↑ Gonzales, Ron (December 17, 2004). "Label switch frees HED p.e.". Albuquerque, New Mexico: The Journal. Retrieved 2008-08-23. ↑ Dansby, Andrew; Florio, Steven; Heller, Greg; Uhelszki, Jaan; Vineyard, Jennifer (November 2, 2000). "Really Randoms: Robbie Williams, Eminem". Rolling Stone. Retrieved 2008-08-23. ↑ Van Horn, Teri (January 17, 2001). "(hed) pe Shoot Video For Song On 'Graceland' Soundtrack". MTV News. ↑ "Charts and awards for Blackout". Allmusic. Retrieved 2008-08-23. ↑ Loftus, Johnny. "Review of Blackout". Allmusic. Retrieved 2008-08-23. 1 2 3 4 5 Friedman, David (March 26, 2009). "(hed) p.e. brings N.W.O. Tour to Hartford". Danbury, Connecticut: The News-Times. Archived from the original on July 5, 2009. Retrieved 4 April 2009. ↑ "Charts and awards for Only in Amerika". Allmusic. Retrieved 2008-08-23. 1 2 3 Loftus, Johnny. "Review of Only in Amerika". Allmusic. Retrieved 2008-08-23. 1 2 "Interview with (hed)P. E.". Live-Metal. July 28, 2006. Retrieved 2008-08-23. ↑ "Charts and awards for Back 2 Base X". Allmusic. Retrieved 2008-08-23. ↑ Theakston, Rob. "Review of Back 2 Base X". Allmusic. Retrieved 2008-08-23. ↑ "Charts and awards for Insomnia". Allmusic. Retrieved 2008-08-23. 1 2 "Hed PE - Biography". Suburban Noize Records. Archived from the original on 2008-07-25. Retrieved 2008-08-23. 1 2 Sculley, Alan (August 28, 2008). "(Hed) p.e. wants (no) interference". Naperville, Illinois: The Wichita Eagle. Retrieved 2008-08-23. 1 2 3 4 5 6 "Truth Rising Review". Kik Axe Music. Archived from the original on 30 October 2010. Retrieved 3 November 2010. 1 2 3 "Truth Rising Review". 411mania. Retrieved 3 November 2010. ↑ "(Hed) PE Heads to Nocturnum, frontman Jahred Gomes talks history". Times-Standard. October 2, 2012. Retrieved 2010-10-02. ↑ "Jahred Gomes speaks out on Facebook about 2014 album". Facebook. January 1, 2014. Retrieved 2014-01-01. ↑ "Hed PE releases official announcement of new album release date on Facebook". Facebook. May 13, 2014. Retrieved 2014-05-13. ↑ "Hed PE releases official teaser of new album release date on Facebook". Facebook. May 13, 2014. Retrieved 2014-05-13. ↑ "Rock Tracks". Billboard. Nielsen Business Media. 112 (27): 20. July 1, 2000. ISSN 0006-2510. ↑ Aiese, Eric (April 5, 2003). "Demons Are The Reason For (hed) pe's Blackout". Billboard. Nielsen Business Media. 115 (14): 13. ISSN 0006-2510. 1 2 Boehm, Mike (October 29, 1996). "Mix of Rap, Punk Portends hed Start". Los Angeles Times. Retrieved 2008-10-30. ↑ "Truth Rising Review". Kik Axe Music. Archived from the original on 30 October 2010. Retrieved 3 November 2010. 1 2 "Interview with Jared Gomes of Hed PE". Rock Edition. Retrieved 3 November 2010. ↑ "(hed) PE". The Bradenton Herald. March 4, 2005. Retrieved 2008-10-05. ↑ Baril, Jason (April 4, 2003). "On stage: Hed p.e. headlines Bumstock". The Maine Campus. Archived from the original on December 11, 2008. Retrieved 2008-10-05. ↑ "(HED)P.E Announces Co-Headlining Tour With Kingspade". The Gauntlet. January 5, 2008. Retrieved 2008-10-07. 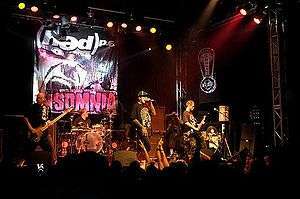 Wikimedia Commons has media related to Hed PE. Major Pain 2 Indee Freedom: The Best of Hed P.E.